The Grauer School is proud to offer our students one of the best performing arts programs of any private school in Southern California. We understand that positive self-expression resulting from performing arts programs during the middle and high school years shapes a student’s life in fundamentally important ways. Our performing arts programs are part of a holistic academic experience stressing confidence and personal achievement. This prepares Grauer students to be excellent learners and outstanding social leaders for the rest of their lives! Empathy and Compassion. It takes a tremendous amount of compassion and empathy to step into someone else’s (fictional or factual) shoes by performing as them in front of a live audience. Whether appearing on stage or serving behind the scenes as vital support staff members, some of the main benefits of performing arts in education are teamwork, communication and the emotional maturity resulting from taking different vantage points. Our students to see the world from a larger perspective than their own. Self-Confidence and Empowerment. In almost unheard of numbers (on nationwide surveys), Grauer students find themselves taking their in school learning to their lives outside of school. It takes confidence and courage to perform or display art in front of others—all parents dream of this for their children. For students who are not initially comfortable in front of audiences of any size, facing one’s fears and succeeding gives students personal empowerment that positively impacts their lives inside and outside of the classroom. Higher Academic Achievement. As many studies demonstrate, such as this Arts Education Partnership study, students who experience an education rich in music, drama and dance have a greater proficiency in reading, writing and even mathematics than students who don’t. This is why we are dedicated to providing a STEAM-based education by combining STEM and the Arts for a holistically balanced educational experience. 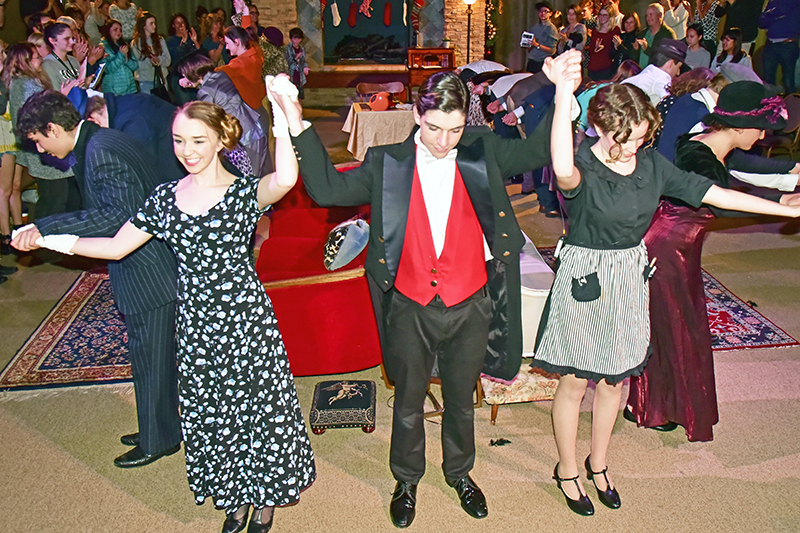 The Grauer School Theatre Arts program strives to create productions from various genres and eras that are fresh and unique. Through our forward-thinking courses, students in our Theatre Arts Program have the opportunity to embrace all types of leadership and roles such as actors, designers, writers and directors. Our Theatre Arts Program aims to excite students about the craft of theatre and and always provide a safe space to create and collaborate. The Visual Arts Department encompasses many mediums ranging from graphite, charcoal, ink, watercolor, acrylic, and digital, to 3D mediums as well. We emphasize growth in concept, as well as technical skills and encourage students to step out of their comfort zone, experiment, and love the process just as much as the final product. Intrinsic motivation is also emphasized in the department, encouraging students to bring and share their passions which helps drive this motivation and intellectual curiosity. The Visual Arts Department offers flexibility and choices for our students within each class, and encourages interdisciplinary collaboration within the overall Arts Department and into other departments as well (English, Science, Math, etc.). The Grauer Music Department is a collaborative, hands-on program that fosters each student's unique relationship with music with an emphasis on performance, as well as the following: composition, theory, critical analysis, music history, technology, and the intersection of music with other disciplines. Within our Music Art Programs, our honors and internship programs allow students to explore individual musical topics of interest in depth. The small class sizes in our Music Art Programs allow for each student to receive hands-on instruction on the instruments of their choice, and each student has important roles in smaller ensembles, rather than playing a small part in a large ensemble. Age mixing enables student mentoring and whole-school cohesion on musical collaborations. Grauer is world-renowned as an academic and social leader in the small schools movement. Our steadfast commitment to prominently featuring performance arts in and out of the classroom makes The Grauer School one of the most diverse private performing arts schools in California for middle and high school students of all backgrounds and cultures. Grauer's Film Studies class went on a field trip on Friday, March 8 to take a a tour of the student-run CHSTV television studio, where they were able to view broadcast equipment in action during a live broadcast. On February 8, The Grauer School celebrated its annual Asian Lunar New Year assembly to welcome the Year of the Boar.